It’s funny how fast time goes by. It seems like just yesterday that I was unemployed and embarking on my year-long journey of giving $10 away to strangers. For those of you who have followed this adventure in giving you know for me it wasn’t about the money. Sure I needed the money and it might have been foolish to give away $3,650 while being out of work, but it was about something larger. It was about community. It was about kindness. It was about hope. And it was about the stories – the stories of a community of strangers that allowed me into their lives. But it was also about time and how we choose to spend it. I discovered that we control very few things in our hectic lives but in the end we have the most control over our time and how we spend it. Last year I chose to spend my time volunteering at least once per week with a different organization. You can read about this amazing year of service here. 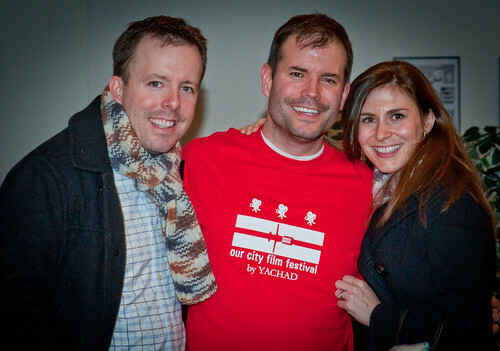 That’s me in the middle with my brother and sister-in-law at a recent volunteer outing for http://www.yachad-dc.org! But what now? Many people have written to me asking what I will do for 2012. Well, there are lots of things in the works…most of them are much less public than the endeavors of the previous two years. Here’s a look at what is keeping me busy in 2012. Spending time with loved ones – Life is too short. I know that sounds very cliché but it’s true. Don’t forget to stop your busy life to spend time with those you care about. In the end, that’s what it’s all about.